University of Illinois Press, 9780252078538, 258pp. 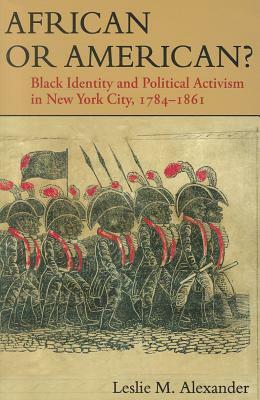 In this illuminating history, Leslie M. Alexander chronicles the development of Black activism in New York from the formation of the first Black organization, the African Society, in 1784 to the eve of the Civil War in 1861. In this critical period, Black activists sought to formulate an effective response to their unequal freedom. Examining Black newspapers, speeches, and organizational records, this study documents the creation of mutual relief, religious, and political associations, which Black men and women infused with African cultural traditions and values. In the end, the Black leadership resolved to assert an American identity and to expand their mission for full equality and citizenship, signaling a new phase in the quest for racial advancement and fostering the creation of a nascent Black Nationalism. Leslie M. Alexander is an associate professor of history at the Ohio State University and the coeditor of We Shall Independent Be: African American Place Making and the Struggle to Claim Space in the U.S.